With all of the cases of various diseases and disorders we hear about, noticing a lump on the back of the neck may be alarming to many people. A sudden change in our bodies can be a sign of an underlying issue or it may be nothing to worry about. Whether it is a lump under or on the skin, it is best to see your doctor—if only to put your mind at ease. There may be many reasons why you have a lump on the back of the neck. Most lumps go unnoticed and are usually benign. A bump on the back of the neck may not cause any pain or discomfort. The size and location of a lump determines the cause and seriousness of the possible health condition. We will explore the five most common causes. 1. Injury to a muscle or tendon, from an accident or strenuous movement, can result in a lump on the back of the neck. The lump may be the muscle itself as it moves in place when damaged. Our muscles and tendons maintain our body shape. You may feel pain, neck stiffness, or have difficulty moving your neck. This is a very common cause of a lump on the back of the neck. Treatment is usually rest, ice packs, and over-the-counter pain relievers. 2. Tonsillitis, or inflammation of the tonsils, usually begins with a lump at the front of the neck with a lump appearing at the back once the infection begins to spread. Located at the back of the throat, just above the end of the tongue, the tonsils are responsible for preventing harmful bacteria from entering our body. Once the tonsils become full of bacteria, they swell and can become infected. Symptoms include pain in the throat, fever and difficulty swallowing, in addition to a lump. These can be treated with salt water gargling, antibiotics, or in extreme cases, surgery. 3. Swollen lymph nodes are very common with colds and a sore throat and can present as palpable lumps on the neck, particularly on the back of neck in some cases. The lymph nodes are located throughout the body, mainly in the neck and underarm regions and are part of the lymphatic system. The lymphatic system is vital to our circulatory and immune systems as it is comprised of small vessels of lymph fluid that flows throughout our body to prevent infections. Bacteria is held in the lymph nodes to be destroyed by the white blood cells. Swollen lymph nodes signal they are filled with bacteria causing them to become enlarged and present pain in the neck region. Another cause of swollen lymph nodes is glandular fever. If the cause is a bacterial infection, antibiotics will be prescribed and rest is recommended for viral infections. 4. Lymphoma is a cancer caused by the abnormal multiplying of these white blood cells that circulate in our lymph fluid. As they collect in the lymph nodes, they form a tumor, which can be seen and felt as a lump on the back of neck. There is no pain associated with these lumps and other symptoms can include night sweats, fever, fatigue and itchiness. Treatment includes chemotherapy, radiation, and possibly surgery. 5. Neck boils are another common lump appearing on the back of the neck. Filled with a bacterial infection, these boils occur from poor hygiene, diabetes, skin damage, or clotting. Beginning as a red bump, the boil hardens and may change color as it fills with pus. It can become quite painful and be accompanied by fever and swollen lymph nodes. Warm compresses are suggested with antibiotics and possible drainage performed by your doctor for treatment. As noted, a lump on the back of the neck can be caused by various health conditions, some serious and some not so serious. The location and appearance are important signs to a doctor in determining the cause and treatment for the lump as there are various muscles, organs and tissue in play. Some of the areas that may cause concern include neck muscles, lymph nodes, thyroid gland, larynx, cervical vertebrae, and numerous arteries and veins. Depending on the cause, there are neck lump treatments as discussed in the common causes above. 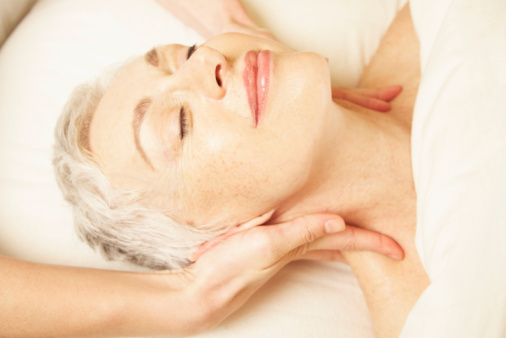 There are additional steps you can take to prevent a natural lump from forming at the base of the neck with age. Prevent an osteoporosis-related lump on the neck by having the recommended daily allowance of calcium and vitamin D.
Exercising regularly and maintaining a healthy diet will reduce your chances of obesity and thinning bones. Maintain proper posture to avoid a rounded back. Tips for sitting properly include leaning forward from the hip joints, having feet slightly placed under chair, placing hands on the chair sides, sit with pelvis up off chair with it tilted to front of chair, and unbend from hip joints and lean back against chair. Standing properly allows for the pelvis not to be thrusted forward but more under you, relaxing the back and dropping the chest. Daily exercise for the spine involves relaxing the right arm to the side then drawing the shoulder back and down so the arm is turned out. This movement will allow the shoulder blade to flatten. Repeat with left arm. If you feel a lump, or bump, on back of head, remember not to panic as there are many causes for this condition. You may, or may not, experience pain and most of the time, there will be no interruption to your daily activities. It is important to note any symptoms you may be having such as fever, aches and pains, sore throat, or fatigue. Depending on the location, your doctor will be able to determine the severity of your condition and suggest the best treatment for it, whether a home remedy or medical tests.